My husband and I were recently in Ann Arbor, Michigan. There is this great deli that we always have to visit, and based on the hour plus wait just to get inside, apparently it is a place that everyone needs to visit while they are there. You might think, an hour long wait to get inside? Something must be WRONG! Actually, it is just that GOOD, that people are willing to wait. And it’s no one thing that keeps people coming back, ordering from across the country, waiting in the heat, the rain, the snow (true story). Zingerman’s Deli in Ann Arbor is an incredibly successful business, and on our most recent trip, as I waited in line, I realized so many amazing things that it does to create that success, and they are things that can be translated into any business model. Add value – for FREE! Yep that’s right, they give stuff away. They offer samples, and lots of them. They have super cool staff walking through the line offering you pieces of cheese, meats and breads from their deli. Then again right before it’s your turn to go inside they have a table of samples; cured ham, potato salad, chicken pasta. Once you head inside the deli, you’ve got more samples of fresh cheese and meat on your left and cinnamon pecan bread with apple butter spread on your right. So this is pretty cool for someone who is waiting in line and getting hungry, right? Yes! But the neat thing is, it is also pretty cool for business because most of the time people end up buying something they hadn’t considered purchasing before they sampled it. They are keeping customers happy and they are increasing sales, all with one simple distinction, add value for free! Think samples, think trial offers, think free products. A Happy Staff = A Happy Customer. Zingerman’s staff is awesome, which is very simply put. They love what they do and you see it in the most simple of actions. They chat with people in line, they get to know everyone and make it feel like a little deli line community. We had a guy who chatted with us and got to know us in a span of two minutes, we saw him a few minutes later and he introduced us to another staff member, repeating everything we had told him. He seriously listened, and it was really authentic and cool. “These are the Coopers, they are from LA visiting for the game and thinking of renting a place out here in Ann Arbor. This is her fifth trip here and he went to UM.” Who remembers all of that? Apparently a guy who spends all day connecting – really connecting – with the guests at Zingerman’s. The staff has fun with what they do, they work well together, they are always looking out for the customers, finding ways to make it as enjoyable as possible and thanking everyone for waiting so long. Knowing is Growing. Remember I told you how the staff gave out samples? They also know everything about the food here. They will give you a piece of cheese, tell you where it was made, how it was made, what it’s made of, how long it’s existed, and how old this exact piece of cheese is. Now that’s a piece of cheese I want to eat. They aren’t just working a job, they are living their job. They know that positioning themselves as experts will grow their business. It’s much like the story of Gary Vaynerchuck (of wine library tv) who, from a young age, became an expert in wine. He learned everything he could about the different types of wines, he wouldn’t recommend a wine without knowing everything about it and feeling confident in his recommendation. He became the ultimate wine expert, people came to him with questions, trusted his knowledge and because of that, his business grew exponentially. Know your product, know your service, know your clients and you will grow your business. People want answers and advice. Especially when it comes to food and drink, people don’t want to have to think. Quality is King. In the end, you have got to have quality. Zingerman’s food is amazing, fresh and unique. That along with all of the other factors is why we are willing to wait an hour in line just to order, and another hour to get our food, which we then inhale in a matter of 10 minutes because it is just that good! There is something about their food that sets them apart. It is quality, it tastes great and they make every sandwich, every salad, every jalapeno pickled peach (seriously!) with the same effort as the last. There was a staff member that told us a group of lawyers in Los Angeles have a monthly meeting for 25 people and they order Zingerman’s reuben sandwhiches all the way from Michigan! Zingerman’s ships them all of the makings and sides and goodies from Michigan to Los Angeles. The consumer has chosen this option instead of going to one of a hundred deli’s in Southern California. 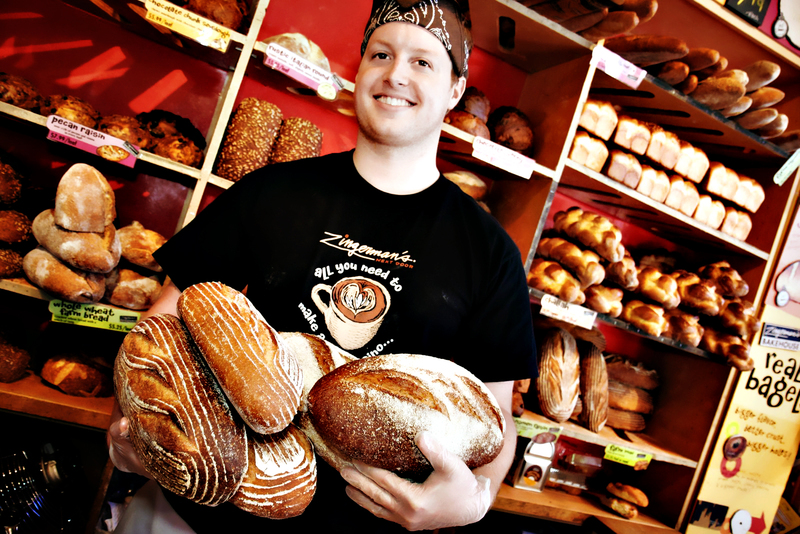 Zingerman’s is a staple in Ann Arbor, Michigan and a staple in the hearts of anyone who has been there. It’s our tradition to stop by for amazing french toast, pack up breads, cheese and meats for a picnic or have some delicious soup and knish.